A development application has been submitted by Sanchi Development for a 20 unit residential building located at 79 Swann Road, Taringa. The site currently contains an existing house and is not located in the Traditional Building Character Overlay. The proposal includes 3 levels of basement car parking, ground floor entry, communal roof top terraces, gym and BBQ facilities. 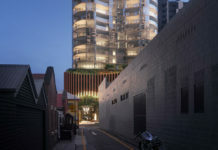 The development application notes that the site falls away from Swann Road allowing the proposed design to provide a building height consistent with adjoining multiple dwellings. Furthermore, the design includes a significantly recessed upper level and treated facade to presents as 5 storeys to the rear property boundary and adjoining dwelling houses. 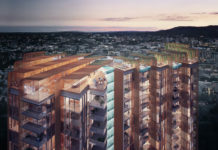 According to the development application, the project has been driven by a desire to encompass principles of sub-tropical design in order to generate a climatically responsive outcome which offers maximum amenity for residents to enjoy Brisbane’s climate. The development application number for this project is A004909776. 1. The shadow effect on buildings south of the proposed development should be demonstrated particularly for the winter months. 2. The car parking proposed for residents is inadequate. 3 bedroom apt. require at least 2 car parks each and most 2 bedroom apts. also 2 ( or 1.5) parks. 3. No visitor or trade parking is apparent. 4 . No storage for residents is apparent.